Throughout his trading career, Livermore has been used by others. In one instance in particular, Livermore was used by the president of a brokerage house to help out other clients. 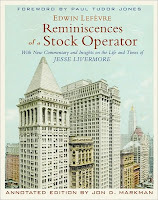 Since Livermore was known as a heavy short-seller (whether true or not, this was the public perception), he was offered favourable terms by this brokerage house, in order that when stock sales were executed by some of the long clients of this brokerage house, it could be explained away as Livermore's short sales (and result in a better execution price for the long clients). At the time, however, Livermore did not see that he was being used, and instead found this president to be of immense generosity. This taught him an expensive lesson in human nature. The perceived kindness of this president caused Livermore to listen and accept this man's suggestions more than he should have. It is to this human trait, allowing someone who is kind more influence than someone otherwise unkind, that Livermore attributes to yet another wipe-out of his portfolio. As a result of this particular bust, Livermore was over $1 million in debt to various brokers and friends. He found that psychologically he could not make money in the market with these debts hanging over him, and so he went to his debtors to ask for loan forgiveness, but with the full intention to pay back in the future. The newspapers bashed him for needing loan forgiveness, and this saddened him greatly. With the loans forgiven, Livermore once again rose to prominence by running with a bull market and then successfully shorting a bear market. He paid off his forgiven debts, and having learnt a lesson in human nature, he set up irrevocable trusts to provide for his wife and child so that even if he were to beg his wife for money, legally even she could not alter the trust to grant him funds.